Recently I’ve been asked about the names of the streets illustrated in the “Crisp Map” of 1711. This map, published in London in 1711, depicts the small urban settlement of Charles Town confined within a system of walls. A number of features in the town are marked with letters or numbers and identified in an accompanying “Explanation” or key. Unfortunately, the names of the streets are not included in this key. By referring to other contemporary documents, however, we can identify the street names with some confidence. When the “Crisp Map” was published in 1711, the South Carolina legislature had not yet legally confirmed the names of any of the streets in Charles Town. In 1722–23, during the short-lived incorporation of what was known as “Charles City and Port,” the provincial legislature contemplated the official naming of the streets as part of a complete re-survey of the town. The British Parliament disallowed the incorporation of Charles Town, however, and the matter was dropped. Again during the mid-1730s, the South Carolina legislature ordered a re-survey of the town and in 1736 attempted to pass an act to confirm the names of the streets. This measure failed, but in a separate act the name of Dock Street was legally changed to Queen Street. By the middle of the eighteenth century, the remaining street names of Charles Town had become so well established by common usage that they resisted change. Only after the incorporation of the city of Charleston in 1783 did the municipal government regard street names as fixed titles that required legislation to alter. In the absence of “official” street names in 1711, therefore, the streets of Charles Town were designated by fairly flexible system of nomenclature. The street along the waterfront of the Cooper River, for example, was commonly called “the Bay” or “the Bay street” or “Front Street.” Today it’s called East Bay Street, but that name doesn’t become common until the mid-1700s. The broad central thoroughfare perpendicular to the river was originally designated “Cooper Street,” in honor of Lord Anthony Ashley Cooper, the first Earl of Shaftesbury, but the descriptive name “Broad Street” has endured in common usage for more than three hundred years. Several early legislative records mention “South Street” and “North Street” as the other two principal thoroughfares in early Charles Town. These names were occasionally used to designate the two streets parallel to Broad Street, which we now call Tradd Street (south of Broad) and Queen Street (north of Broad). The surviving records of the early granting and conveying of town lots in urban Charles Town contain many references to streets. From these records, which date back to the 1680s, we learn that street names were most frequently determined by prominent landmarks along their path. The “South Street” perpendicular to the Cooper River, running past the house of Richard Tradd, was commonly called “Mr. Tradd’s Street” (today’s Tradd Street). Similarly, the “North Street” ran past Edward Loughton’s dock (built in 1706) near the bay and was best known as Dock Street (today’s Queen Street). The Street that ran past the Anglican church was called “Church Street” until the church moved in the 1720s. At that time the street in front of the new Church became “New Church Street” (today’s Church Street), and the street by the old church became “Old Church Street” Since the mid-1700s, however, Old Church Street has been more commonly called “Meeting Street” because its path also ran past the Meeting House of the Independent Congregational Church. So what are the names of the streets depicted in the “Crisp Map”? The street fronting the Cooper River is “the Bay” or “Bay Street,” today called East Bay Street, leading from Granville’s Bastion (letter “A” on the map) to Craven’s Bastion (letter “B”). The central street perpendicular to the Bay Street is Broad Street, which leads from the Half Moon Battery and Watch House (letters “G” and “W”) to the town gate (letter “H”). The street leading from Carteret’s Bastion (letter “C”) to Colleton Bastion (letter “D”) was called “Church Street” until the early 1720s, and afterward called “Old Church Street” and then “Meeting Street.” The central street parallel to East Bay Street and Meeting Street did not officially have a name when Crisp published this map, but in the early 1720s it became known as New Church Street, and is now simply called Church Street. The street parallel to and immediately south (left) of Broad Street is Tradd Street, while the street parallel to and immediately north (right) of Broad Street is Queen Street. The narrow street parallel to and between Broad and Tradd Streets is Elliott Street. The narrow lane connecting Tradd and Elliott Street is Bedon’s Alley. The narrow lane connecting Broad Street and Queen Street was called Union Street after the political union of England and Scotland in 1707, but was renamed State Street in 1811. The narrow lane connecting Union Street and New Church Street was called Beresford’s Alley (now Chalmers’ Street). Note, however, that the streets depicted at extreme south (left) and extreme north (right) of the town represent a bit of artistic license. These streets were not part of the original town plan, known as the Grand Model of Charles Town, and, if they ever truly existed, they disappeared after the earthen walls were dismantled ca. 1730. 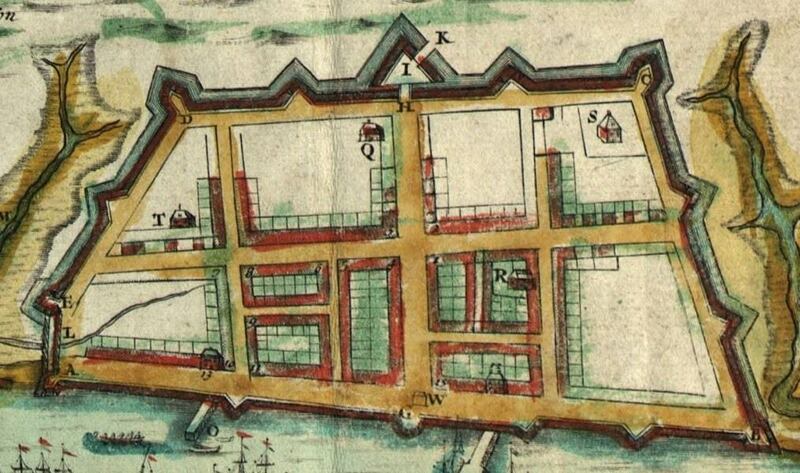 Today’s Water Street was created from the creek depicted south (left) of the town in the Crisp Map, and today’s Cumberland Street was created in 1747 near the site of the north (right) town wall depicted in this map. The more I learn about the map, the more curious I get. About the street names: Do we know anything about Mr.Elliott, Mr.Tradd,Mr. Bedon, Mr. Beresford? Were they just prominent citizens? I am also curious about which streets were the fashinable ones? Where would a doctor live (if the city had one), for example? Yes, the Elliott, Tradd, and Beresford families were early settlers in Charleston. The Elliotts became quite promiment later in the colonial period, but the Tradd and Beresford families died out in the town’s early colonial period. At the time the Crisp Map was made, the streets were not necessarily named for “promiment” citizens, but for citizens whose houses, for one reason or another, served as memorable landmarks in the street. During the early 1700s, the east side of East Bay was lined with commercial shops dealing in imported goods (with residences above), and Broad Street also had a number of storefronts and taverns. Most of the offices of physicians and lawyers were also found on these same streets. Great work, Nic. Thanks for adding in the fascinating bits about how the street names dovetailed with political events. It’s particularly fascinating after looking at all the “country” roads in this and other maps to learn that, at least in the case of the Crisp map, they may have been conjectural. Hope you’re not losing your summer tan up there in the Columbia catacombs.